Two berths are offered on the RV Polarstern under the training remit of Eurofleets2 for postgraduate students (Masters and Doctoral) to participate in the EuroFleets2 BURSTER research survey from 13th to 23rd of June 2016. This expedition will leave from leave Bremerhaven and finish at Longyearbyen in Svalbard. 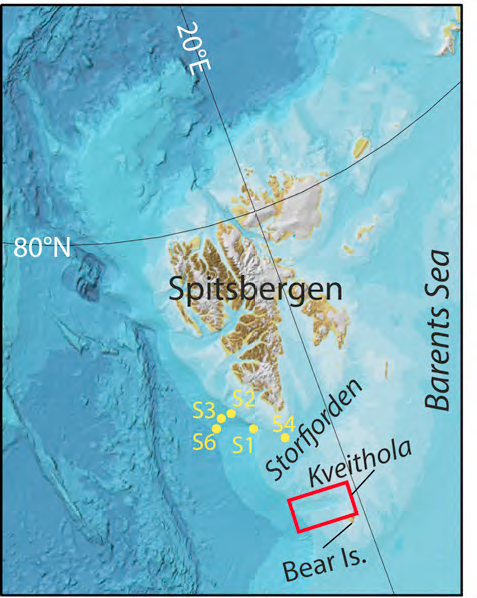 The expedition aims to investigate the hydrographic conditions and active gas seepage present in the pockmark-field piercing the sediment drift located in the inner part of the Kveithola Trough. Additionally it aims to study climate and environmental changes controlling the evolution of living organisms in extreme environments. BURSTER is intended as a preliminary investigation preceding a master project that should include a more detailed and focused investigation of the Kveithola bio-geochemical system over a larger acquisition area and time-frame. This is a wonderful opportunity for researchers and postgraduate students who wish to improve their skills in marine data acquisition on a multidisciplinary arctic survey. Oceanography (CTD, Rosette (biochemistry on water samples), mooring recovery, ADCP, Thermosalinograph, and small autonomous probes for pCO2 and pCH4. Geology (Multi-Corer MUC sampling, Gravity Corer Sampling, micro-faunal analyses and micropaleontology (portable SEM), and gas sampling (Paint cans and/or Head space gas or Rhizons). The programme specifically aims at encouraging the participation of postgraduate students from countries with limited access to the equipment and instrumentation outlined above. An application to join this survey can be accessed here. Applications must be received by Monday 7th March at 18:00 (CET). Successful applicants will be notified by Friday 11th March and must confirm participation by completing a Ships Personnel Questionnaire by Friday 18th March. Ship-time on BURSTER is funded through EUROFLEETS 2 and participants are liable for their own travel and accommodation costs. Participation in the cruise is dependent on passing the required medical exams, evidence of which must be submitted before 2nd May 2016. For further information on the EuroFleets training programmes contact Dr. Andrea Caburlotto at acaburlotto@ogs.trieste.it and also see the EuroFleets Homepage.